A 19th Century museum and art gallery is to be restored and extended with the help of a £6.5m Heritage Lottery grant. The Beaney Institute in Canterbury will have a new rear extension to give more space and improved access, especially for those with disabilities. "A new Beaney will be a magnificent resource for the local community," said deputy leader of Canterbury City Council, Councillor Rosemary Doyle. The building is to close at the end of 2008 and reopen two years later. The grade-II listed Beaney was built with funds bequeathed by surgeon Dr James Beaney, who was born in Canterbury and later moved to Australia. 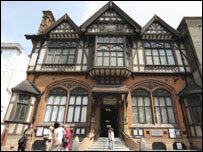 It opened in 1899 to re-house a museum and library located in Guildhall Street. The library has more than two million books plus 17th and 18th Century texts, maps, local newspapers and street directories. While the museum houses Old Master drawings, European oil paintings dating from the 16th Century, work by local artists, English and Continental ceramics and gold and silver jewellery from the graves of the Anglo-Saxon kingdom of Kent. The £11.5m cost will be met from the lottery grant, the city and county councils, plus private sources and donations. "The investment will have a huge impact on culturally-led regeneration in Canterbury, helping make the Beaney a revitalised tourist attraction alongside Canterbury Cathedral," said Sheena Vick, Heritage Lottery Fund manager for the South East.